On January 21, 2019, member of Turkish Grand National Assembly and member of Parliamentary Assembly of Council of Europe Zafer Sırakaya (AK Party) will host the panel “Anti-Muslim Racism in Europe” at the Council of Europe in Strasbourg, France. During this event, the findings of the European Islamophobia Report 2017 will be analysed and discussed in detail. Since 2015, the European Islamophobia Report (EIR) raises awareness of Islamophobia among EU and national representatives, journalists, scholars and public opinion. This annual report provides a unique collection of analysis regarding anti-Muslim racism in 33 European countries. The European Islamophobia Report is presented at several supranational institutions such as the OSCE ODIHR, the European Parliament, and other important international and national institutions. 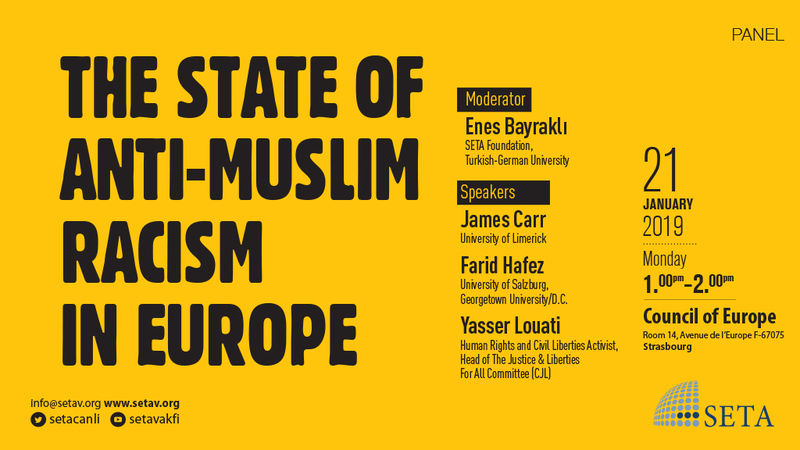 Enes Bayraklı, the director of European studies at SETA and co-editor of the European Islamophobia Report, will lead the discussion in company of Farid Hafez, co-editor of EIR 2017 and author of Austria Report, as well as James Carr and Yasser Louati, respectively authors of the Ireland and France reports. In the light of current developments, the event will serve to draw attention to the rising level of Islamophobia in European countries. We would be honored to have you at our event.